The width of the water resonance in a proton NMR spectrum depends critically on the amount of water present. When the concentration of H2O is very low the NMR resonance is very narrow. When the concentration is very high the width is many times greater. The reason for this is that the strong magnetization of the water signal induces currents in the NMR coil which generate magnetic fields which broaden the line. This phenomenon is called radiation damping. The width of the water line is a function of the strength of the water signal which depends on the amount of water, probe tuning, field strength, coil size etc... Radiation damping can also affect the symmetry and phase of the peak. 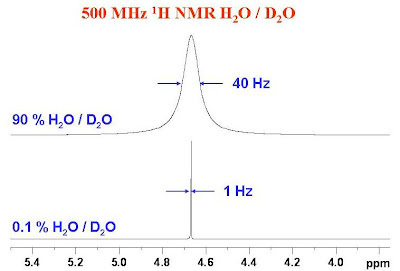 Below are the 500 MHz proton NMR spectra of two samples of H2O / D2O with different concentrations of H2O. In both cases the magnet is well shimmed. Thanks for your comment. If you are measuring a 1H NMR spectrum of a dilute (and even not so dilute) organic compound in a deuterated organic solvent, it is easily possible for the water impurity to be many times larger than the resonances of your compound and still be sharp. This is particularly true for solvents like DMSO-d6 which can often be quite wet. Remamber that it doesn't take very much water to give a large peak. Broadening due to radiation damping is usually only a problem when the water makes up a significant proportion of the sample. Backlinked to this post from NMR Wiki forum! Thanks for the starter post! I believe that your explanation is not accurate. 100% D2O will give you the 2nd graph with a sharp peak. The 0.1% of H20 that you add is completely overwhelmed by the D20 peak. This is to say that the 2nd graph bear no relation to the 1st graph. The wide peak in the 1st graph may not be all due to Radiation Damping. H20 forms clusters of varying sizes (a water cluster with 200 molecules is quite common), and these coupled protons will show spin-splitting shift. We have large number of these shifter peaks and they are blurred into a very fat peak. Thank you for your comment. Respectfully, I must disagree with you on both points in your comment. For the first point, 100% D2O would not give any proton signal at all. 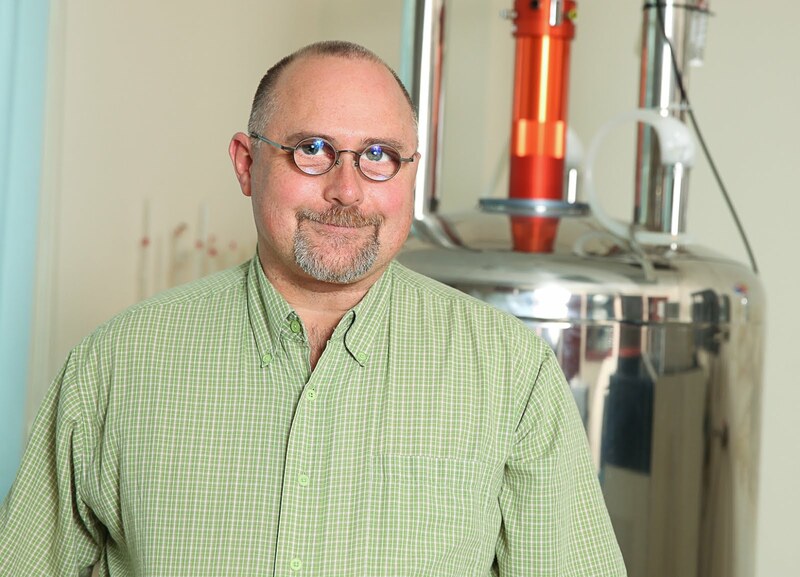 For the second point, while you may or may not be correct about the formation of clusters (I really don't know), the motion and exchange of water molecules in and out of the clusters would be very fast on the NMR time scale. In this case, I am certain that the broadening is due to radiation damping as the signal can be made sharper by detuning the NMR probe. I also did some water samples with 5% D2O. These give much wider peak, half-width ~9Hz, abundance reading ~7, same shift of around 2.33ppm. If it was possible to buy 100.000% D2O, you would (of course) observe no proton spectrum as there simply would be no protons in the sample. The "100%" D2O you are using is likely 99.x% and the signal you observe is HDO. It should come at approximately 4.8 ppm. Could it be that your spectrum is not referenced correctly? I am not sure what you are reporting when you claim an "abundance reading of ~80". The signal for the HDO in your 5% D2O sample may be broader due to radiation damping or shimming. Thanks for the post. Pretty interesting. What if one is working at very low field? Is this an issue for radiation damping? Radiation damping is not usually an issue at very low magnetic field strengths. I have a sample that gives a single proton signal, and found out that when I have 90% H2O / 10% D2O there are "mountains" of peaks around the water signals, which do not show up in 100% D2O. Through reading your posts, I assume this might be a radiation damping issue? It is not about the width of the water peaks, but of the presence of wide peaks at both sides of the water signal at +/- ~1 ppm. I tried presaturation and it did suppress the water peak, but not the others (which again, are absent when using 100% D2O). I've always worked on Bruker, but this is happening on a 500 MHz Varian and I'm only aware (by now) of the PRESAT sequence. What field are you working on? What is the width of the water line? Could you be saturating the receiver? Just wanted to thank you for the great posts. Your explanations are clear and very helpful. We had a sigmoid shaped curve in inversion recovery expweriment on pure H2O. We knew that it was radiation damping. Is there any pulse sequence to remove RD effect? I am not aware of any inversion recovery experiments designed to avoid radiation damping. Hi, first of all I want to thank for the Blog, it is really useful. If I have a solution of a peptide (OXT) 10 mM in 85% H2O, why the few signals that I detect of the peptide have a lot of noise? it has to do with the ADC? Glenn, excellent post as always. In addition to using a inversion recovery sequence with a gradient during the variable delay it is also important to use the area and not the height of the peaks during analysis. During detection RD will be active and broaden the lines more when signal intensity is high compared to spectra obtained near the zero passage. Why Are Some of My HMQC Correlations Doubled? I Only Have 0.5 mg of Sample. What Can I Do?